ADDITIONAL CAST ANNOUNCED FOR ALHAMBRA THEATRE PANTO ALADDIN! The Alhambra Theatre, Bradford has announced more principal cast members who will appear alongside Bradford pantomime king Billy Pearce, stage and screen personality Christopher Biggins and Blue sensation Simon Webbe in this year’s pantomime, Aladdin. 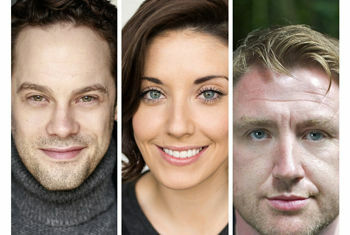 Sarah Goggin (Princess Jasmine) returns to Bradford this year after her appearance in the titular role in last year’s Cinderella; Carl Sanderson as the Emperor; and David O'Mahony as the evil sorcerer Abanazar. Sarah Goggin most recently played Sister Mary Robert in the UK tour of Sister Act for Jamie Wilson Productions. Her previous credits include Rachel in Bad Girls (The Union Theatre); Christmas in New York with Eden Espinosa (Palace Theatre, London/Manchester); A Different Kind Of Christmas Musical (Leicester Square Theatre); Been on Broadway (Vaudeville Theatre); Betty in Sincerely Yours (Landor Theatre); Woman 2 in I Love You You’re Perfect Now Change (Battersea Barge); Jodie in Best Of Friends (The Landor). Sarah has appeared in the workshop productions of Honky Tonk Angels (Wizard Presents, Pete Brooks) and Trash (Courtyard Theatre). Carl Sanderson has appeared in a wide range of musicals including Sunset Boulevard (national tour), My Fair Lady (Sheffield Crucible and National Tour), Hairspray (National Tour), Cats (New London Theatre and National Tour), Phantom of the Opera (West End and National Tour), Beauty and the Beast (Wakefield Theatre Royal) and Peter Pan (West Yorkshire Playhouse). His television and film credits include Victoria Wood Christmas Special, Acorn Antiques The Musical, That Day We Sang (BBC) and The Dresser (BBC). David O’Mahony returns to the Alhambra Theatre and is reunited with Billy Pearce after appearing as Prince Benedict in Snow White & The Seven Dwarfs at the Bradford venue in 2014/15. David’s theatre credits include Beautiful – The Carole King Musical, The Bodyguard and he has played the role of Abanazar in Aladdin previously for Qdos Entertainment at the Royal & Derngate in Northampton. This year’s panto will once again beproduced by Qdos Entertainment, the world’s biggest pantomime producer and the same team behind the annual Alhambra Theatre pantomime for 20 years. Aladdin will be directed by Ed Curtis, returning for his eighth consecutive Alhambra Theatre pantomime, reuniting him with Billy Pearce. With over 58,000 people already set to enjoy this year’s pantomime, make your wishes come true and fly to the box office to secure your tickets for this year’s must-see Alhambra Theatre festive production!